A fifty-eight year old presented for re-evaluation of multifocal contact lenses. She had been previously successfully wearing translating bitoric multifocal GP lenses. As an anesthesiologist, these lenses were causing decreased comfort, intermittent dryness and intermittent blur due to her very specific visual tasks. Multifocal soft toric lenses were attempted without success. She currently wears her progressive addition lenses for work but finds these may also cause blur depending on the operating room set up. Her past ocular history was unremarkable for other eye conditions. No previous injury or significant ocular or systemic disease in either eye. All ocular findings were unremarkable including dilated fundus exam. Custom Stable Aurora multifocal lenses were recommended as an evolutionary step, to address her task specific focal distances, symptoms of dryness and increase stability of her visual correction. 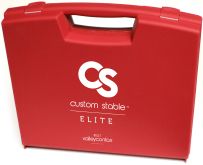 Lenses were selected based on diagnostic fit from a Custom Stable Elite 14.8 fitting set and over-refraction. 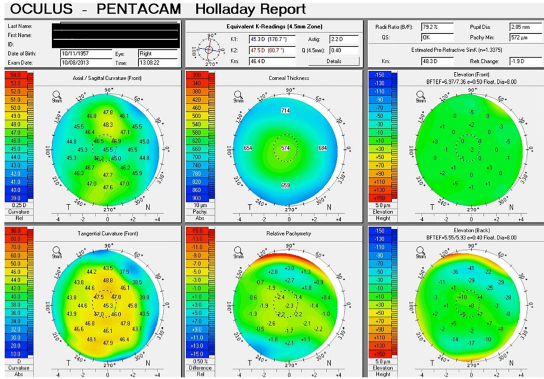 The patient was able to apply and remove scleral lenses and reported excellent initial comfort at dispense. VA was 20/20-2 and 20/40 (OS), 20/25 and 20/20 (OS) near. The patient was instructed to practice application and removal and wear lenses regularly for 2 weeks before re-evaluation. At follow up visit, the patient reported no problems with application and removal along with excellent comfort overall with mild edge awareness left eye. The patient also reported blur at distance left eye that was bothersome. The patient reported excellent comfort, good vision at most distances during the day, and was asked to return in 1 year for annual eye health and vision examination or sooner if symptoms arise.